When I suggested to my family that we visit National Park Hoge Veluwe in the Netherlands, I was thinking about the wonderful art museum and the free bicycles, but I completely forgot that there is also an interesting small natural history museum in the park – or rather, UNDER the park. “Museonder” is a pun on the Dutch words for “museum” and “under” (which, as you might have guessed, are almost the same as the English words, except under is “onder”). The entire museum is underground, and can be accessed from the visitor center, through a sloping tunnel. The ceiling of the museum is almost entirely covered in the excavated roots of a 135-year-old tree, and to make it seem even more like you’re under a tree, there are models of fox and badger burrows (with taxidermied specimens) under the transparent floor. 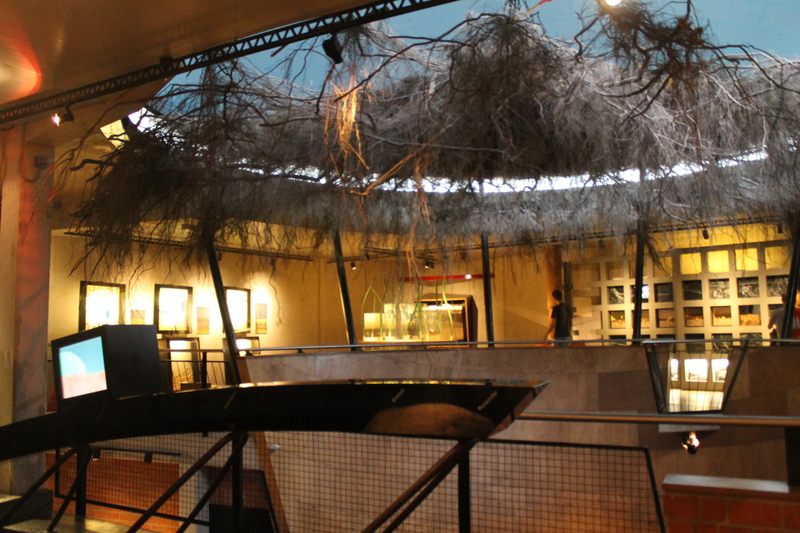 The theme of the entire museum is “things underground”, from paleontology to shifting plates to ground water. It’s a small exhibit, but it’s all about the local environment, to teach visitors even more about the park they’re in. I wouldn’t go all the way to a national park in the east of the Netherlands just for this museum, but when you’re already there, it’s definitely worth dropping in! This entry was posted in Have Science Will Travel and tagged museum, Netherlands. Bookmark the permalink.